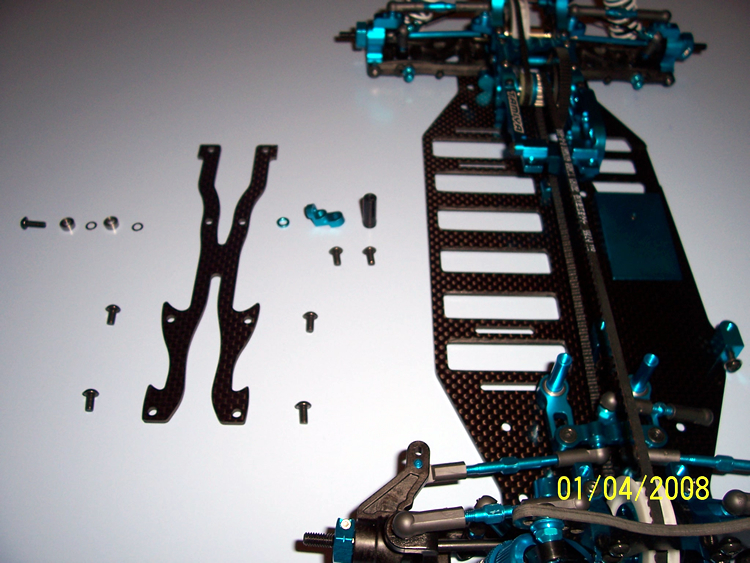 Building the Tamiya TRF415MSXX by Chris Lillywhite. Opening the box... Upon opening the box, I was reminded how good the Tamiya parts quality is and how many parts there are to build a kit! Although the bags are not labeled very well the manual more than makes up for what showing you how everything pieces together. The best advice I can offer is as with any kit, take your time and study the diagrams carefully. Also, although the manual doesn't mention it, I would strongly advise using a very small amount of thread lock when screwing into metal parts and just nip them up, without using excessive force. The reason for this is that any vibration going through the car can very easily shake screws loose, but should you need to later on, the screws will come out relatively easily. 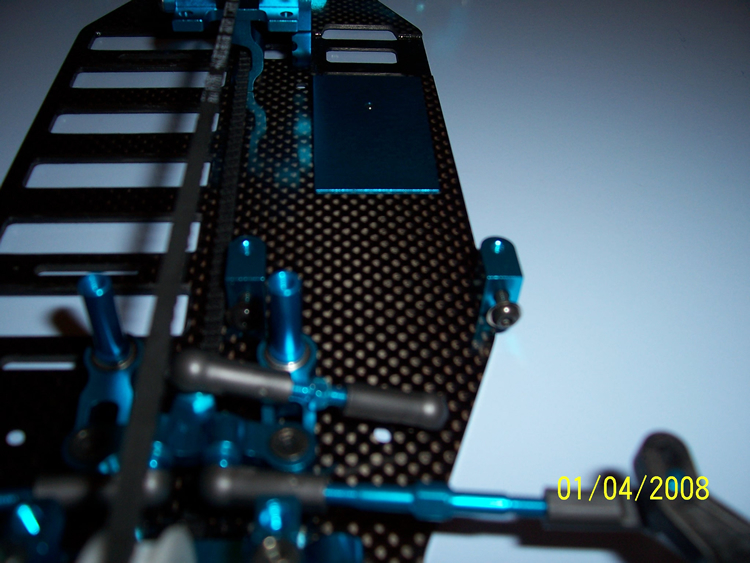 Tamiya make a blue thread lock that is perfect for the job. Part number is TAM87004. If you have accidently put too much on a screw, wipe it off and reapply for the neatest end result. If the screw wont come out at a later date, get a small soldering on the screw head briefly and see if the heat released the locking action of the thread lock and undoes the screw that way. The allen keys supplied with the kit are sufficient to build the car but a good set of allen drivers is a good idea should you need to work on the car later, as is a set of thin nosed pliers. Trim off any excess moulding after you have removed them from the parts trees with a hobby knife as you progress too, it will make the finished model look better and easier to work on. So you do not get confused, the text for each step is above the picture of the step covered.... :o) The build. The first stage of the build involves sanding the slots where the cells fit into and gluing the chassis edges with CA glue. I would use a very fine grit sandpaper when doing this and use a mask, as it is very easy to a) sand off too much (the manual also highlights the importance of this) and b) inhale the carbon fibre dust which wont do your lungs much good! 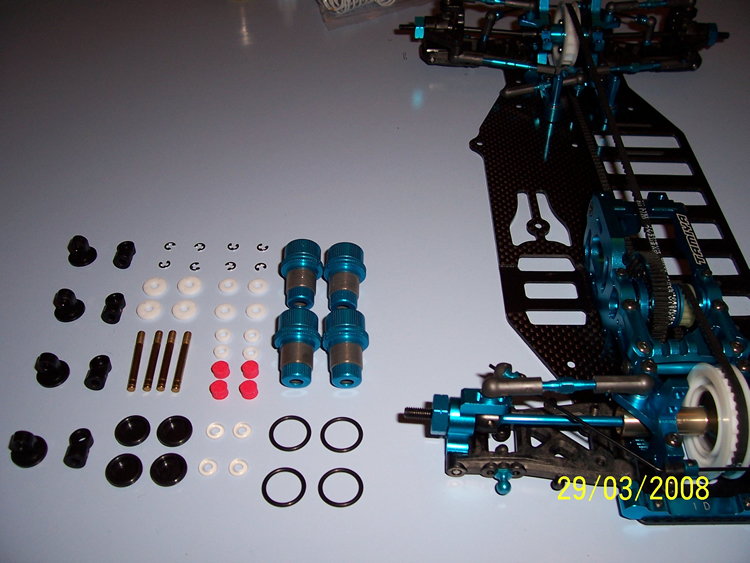 You are then instructed to attach the rear arms and toe blocks to the chassis, by using 4, 8mm screws. The screws in each step are to scale, which is very useful should you need to make sure you have the right screws for the step you are following. 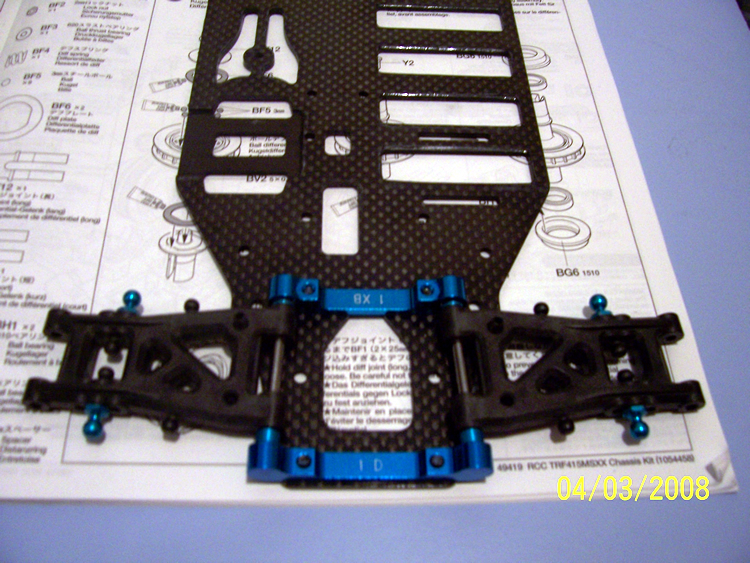 Rear toe in is 3 degree's inboard as per kit build, alternative alloy blocks can be purchased to make the 0.5 degree increment changes. Next is the construction of the rear ball differential. Although this is a basic guide to building the kit, the real test will be on the track or wherever you plan on using the car, and the manual is a good guide. However the differential tension is very important. 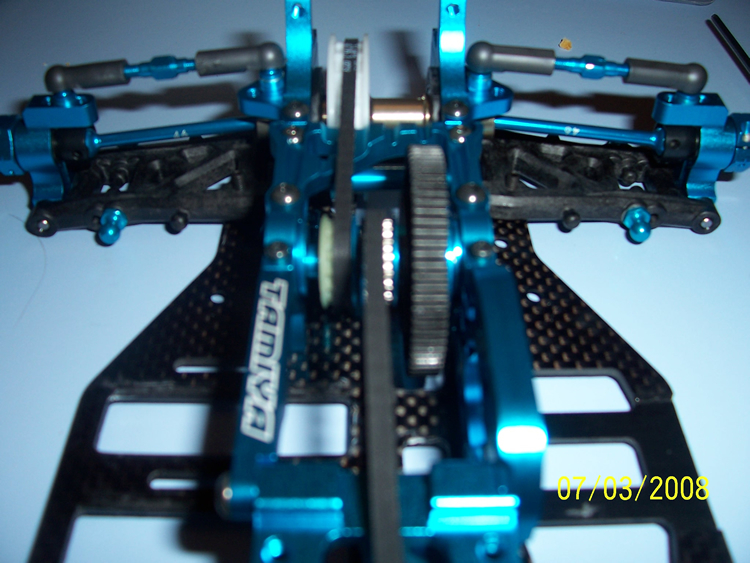 Too tight and you will damage the differential plates and balls, too loose and the car will not accelerate well. For the build I have deliberately built the differential a little on the loose side, that way I can use the car for the first time, gently apply the throttle and see if there is any differential slip, rather than tighten it too much to start with. As said, the manual is a very good guide to building the diff, but be sure not to apply too much differential grease to the plates and thrust race. A thin, evenly spread coating is sufficient. Slowly tighten the cap screw that goes through the centre of the differential, if it feels like its not going in properly stop, undo it a few turns then retighten or you may strip the nylon lock nut. 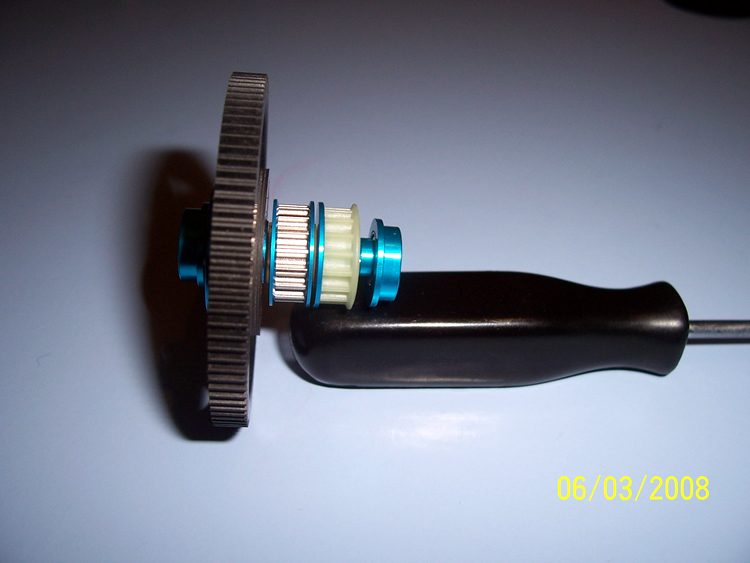 Additional parts (available from JAAD racing products) can really help the life of the differential. The link to part descriptions can be found here: http://www.thard.co.uk/415/tips/JAADRacing.html. Although I cannot say I've used them, they certainly sound very well designed and made. 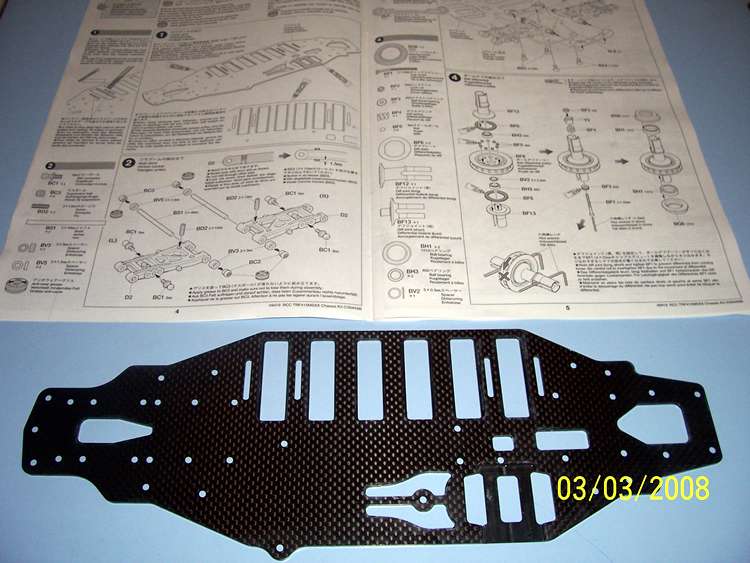 Products include differential covers to keep the dirt out, a spool and a differential. 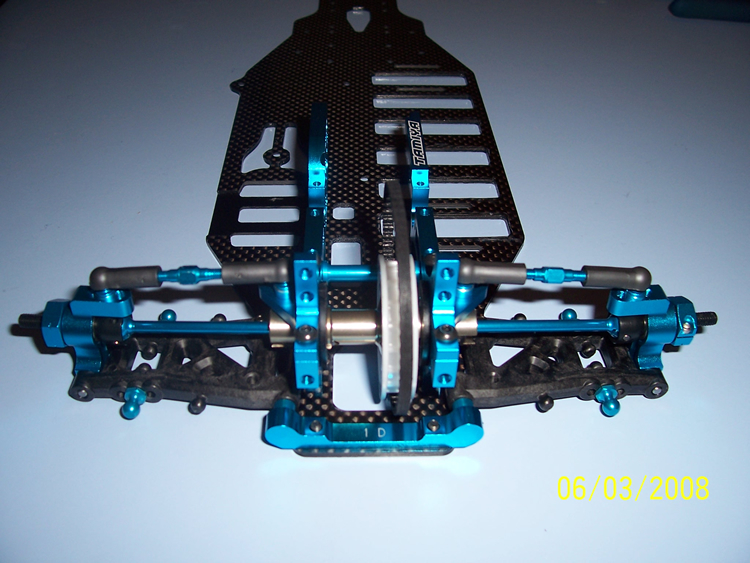 Below is a picture of the Tamiya kit supplied differential. 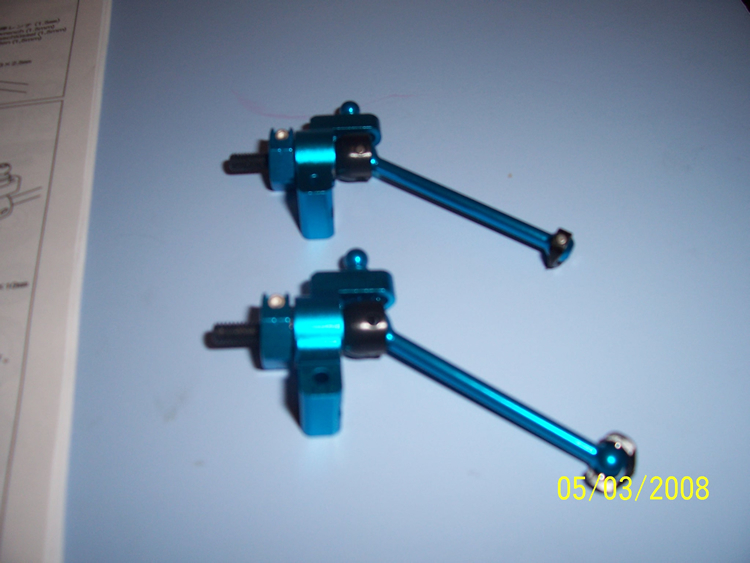 Next on the agenda is building the rear universal shafts and incorporating them onto the hub assembly, on the MSXX only the rear shafts are blue, the front ones are steel to prevent any twisting. 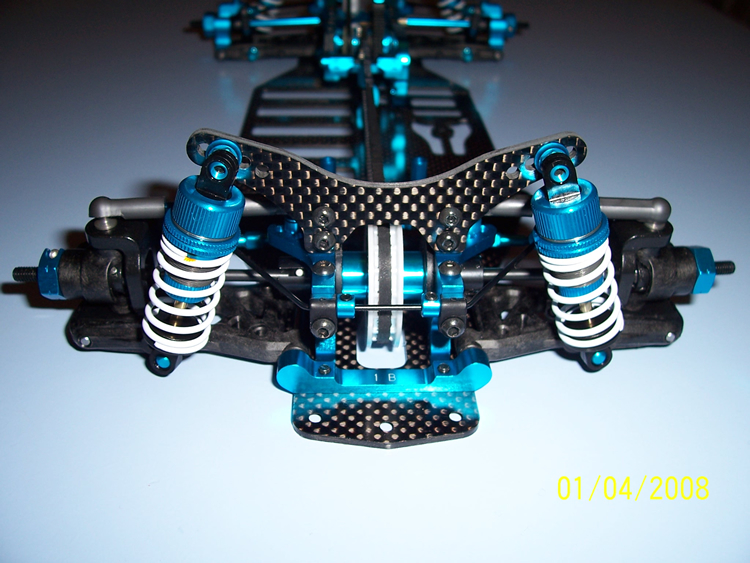 The MSXX MRE has the blue TRF alloy swing shafts all round but these may need replacing more often. 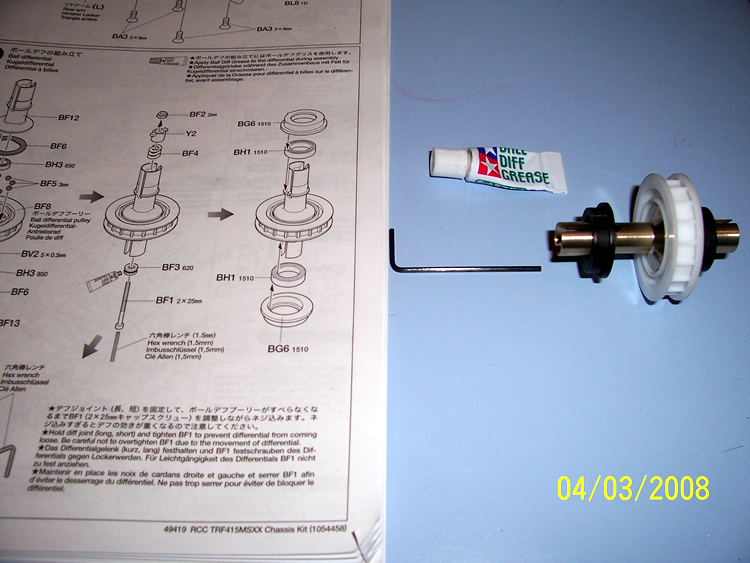 Nip up the grub screw with a little thread lock and lightly lubricate the joint with grease. The rear hubs then need attaching to the previously installed wishbones and the upper link arms popped onto the ball studs. Make sure the grubscrew screws into the flat of the shaft. Use a little threadlock here to prevent the grubscrew from vibrating loose. 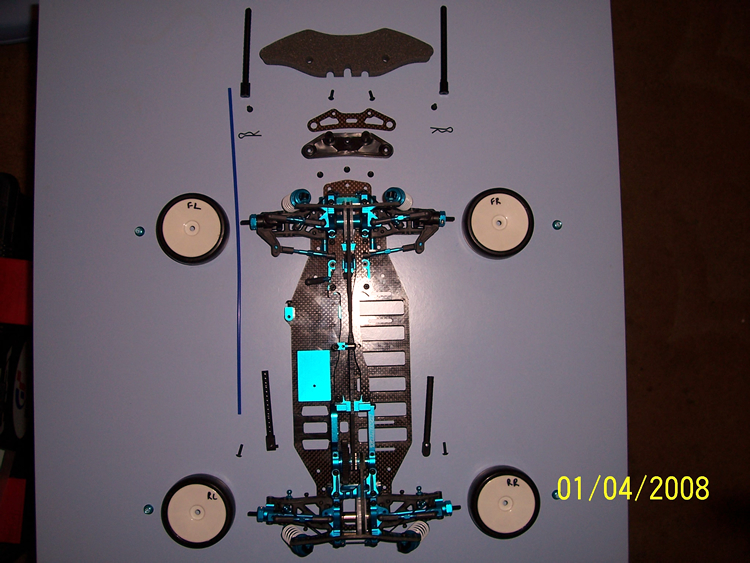 With the rear of the car starting to take shape, the next step is to build the centre shaft assembly. 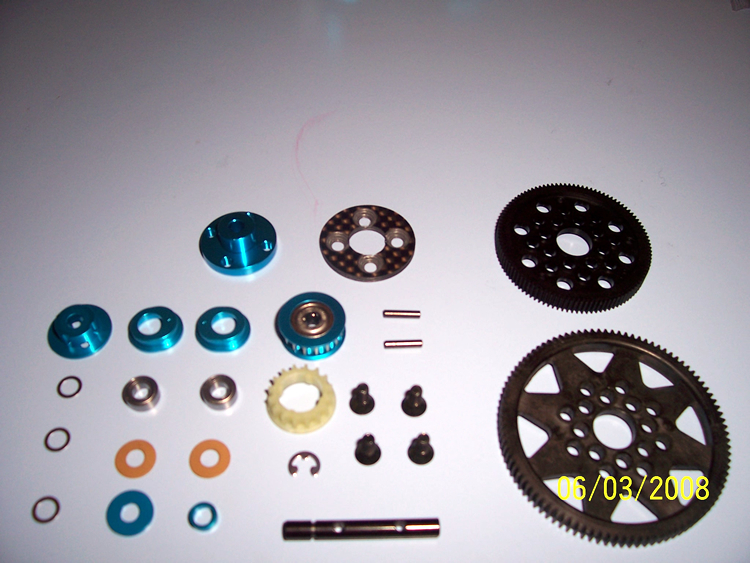 Note the 2 spur gears in the picture, the smaller one is the kit supplied 102t Tamiya supplied spur gear. However, as 48dp and 64dp are more commonly used in racing than the Tamiya pitch gears, I decided to fit my own HPI 64dp spur gear.... However, this didn't go to plan as it was too big. The picture shows the centre shaft assembly with this in situ, but this was later changed to a Kimbrough 72t 48dp spur gear for clearance issues! 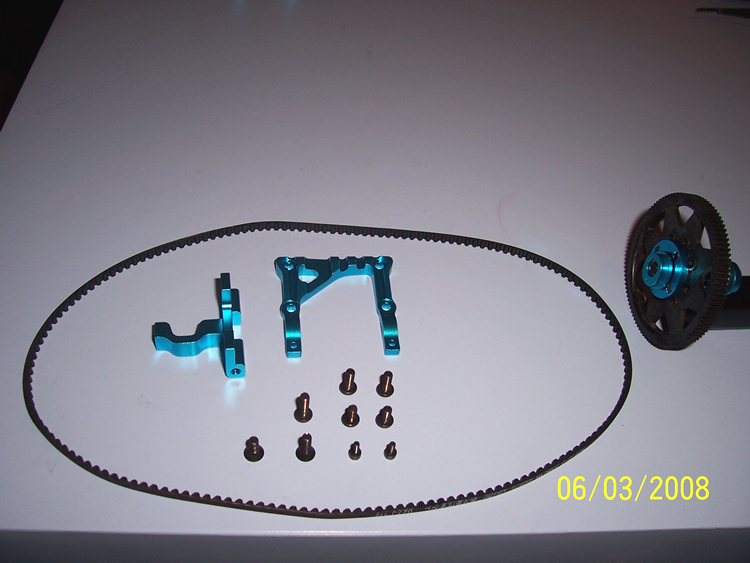 (My HPI spur gear was too big!). Next on the to do list was attaching the spur gear and centre shaft assembly to the gearbox housing. 6 screws thread locked in and lightly nipped up and the car was starting to take shape nicely. If you wrench the screws up too much with "gorilla hands" and you've used thread lock, they will not come out easily should they need to at a later date, so don't overdo it! 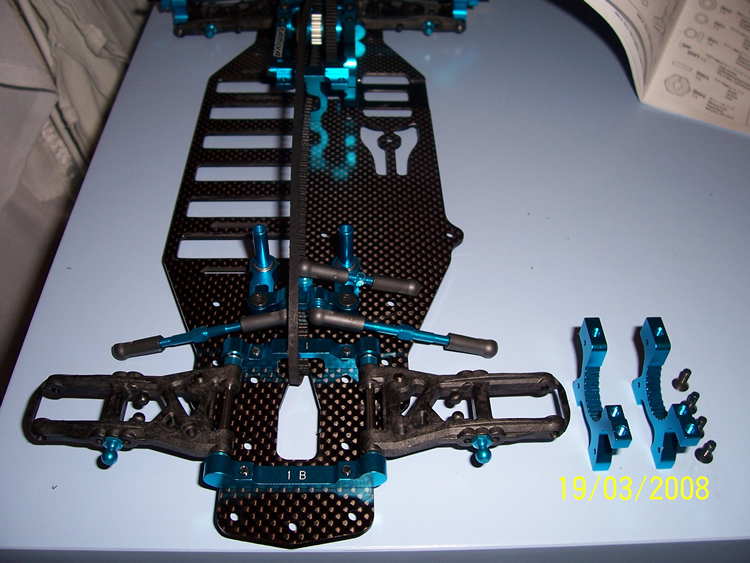 The front wishbones and anti roll bar holders now need building. 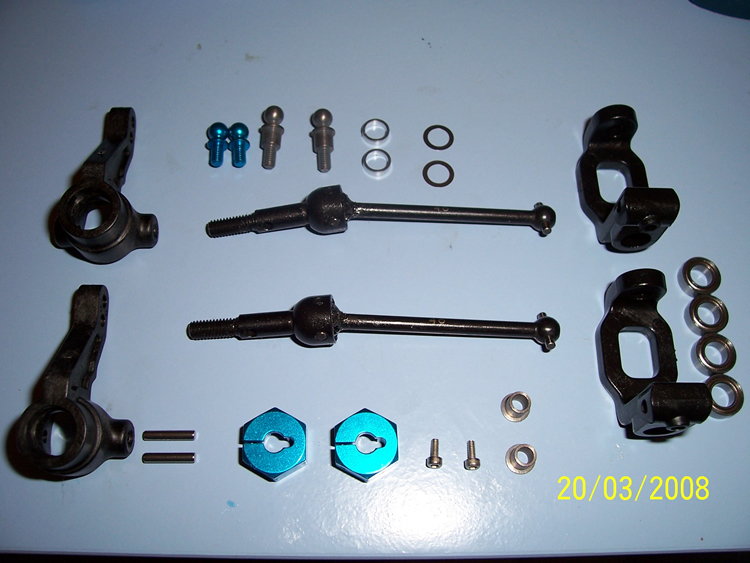 Remember to only put a light coating of grease on the pivot balls, you do not want them fouling up with grit and mud. 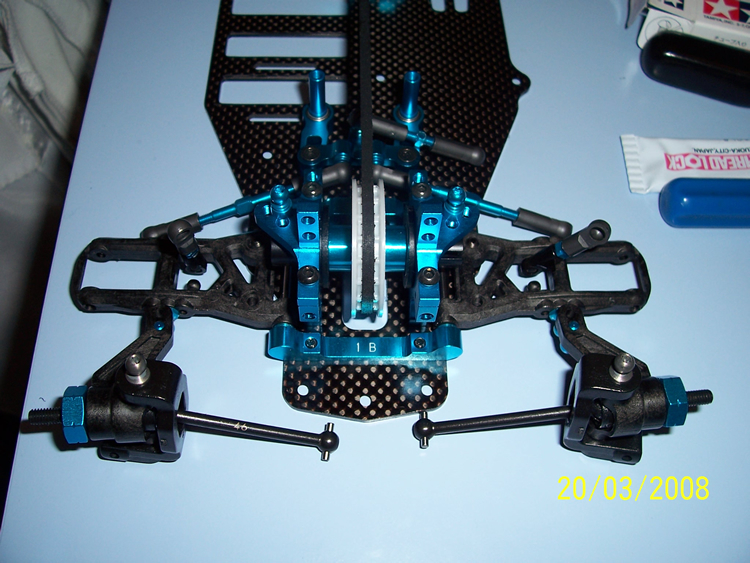 (The anti roll bar mounts on the wishbones are not shown in the picture below, but you will see them in the one after). 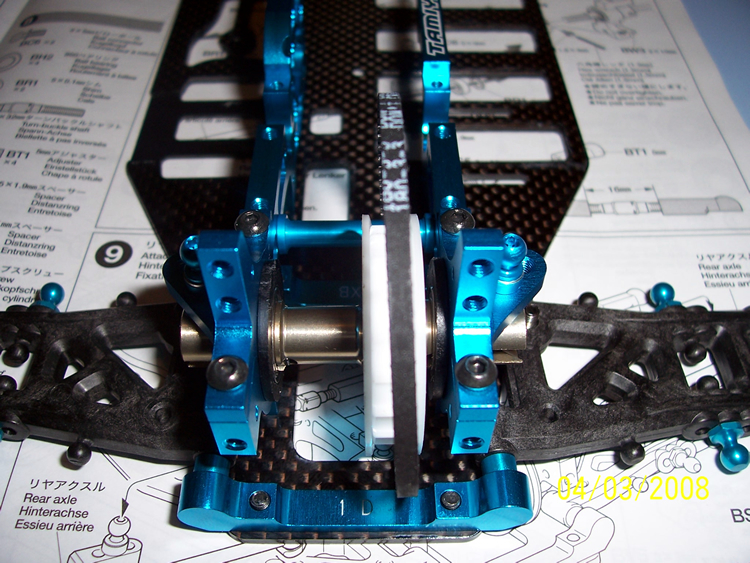 Next the front 1 way differential needs to be constructed and slotted into the gearbox housing. In my haste to get the kit built I didn't actually take a picture of building the 1 way! It is however, a straightforward process providing you take your time and study the manual. Just make sure you use the correct length screws and that the eccentric gearbox locators are fitted into the same groove of the gearbox housing on both sides of the differential. The manual shows this very clearly. Also make sure you have built it, see that the installed the differential in the correct way... or you will soon find out when you use the car for the first time! Luckily it was pointed out to me I had done this before I had chance to install the electrics into the car and use it... Or I would have had some very funny moments on the track had it gone unnoticed! :D The next stage involves building the front axles and attaching them to the uprights. Just like the rear driveshafts, use a light coating of grease on the driveshaft knuckles and a very tiny blob of thread lock on the grub screws, not forgetting to attach the toe rods for the front camber and steering toe adjustment. Below are the before and after pictures of this step. The front and rear anti roll bars (the manual refers to them as stabilizers) now have to be put on the car, make note of the 1mm and 3mm measurements required for the overhang of the roll bars once they have gone through the ball end piece. 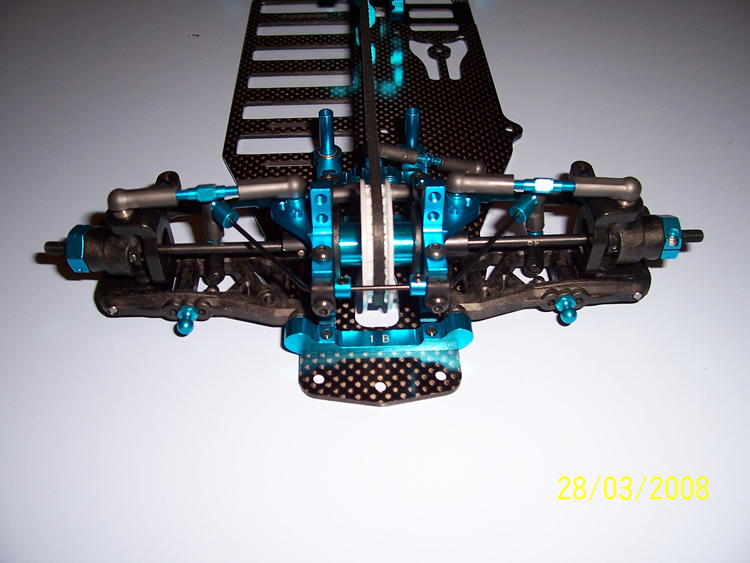 The one pictured is the front roll bar, but the rear roll bar is identical in fitting to the wishbones. 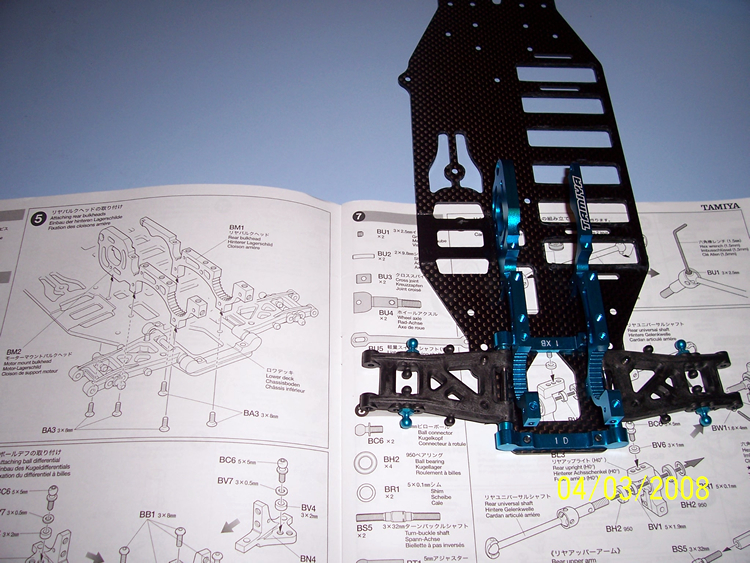 With the wishbones and axle assemblies now on the car, it is time to build the suspension. 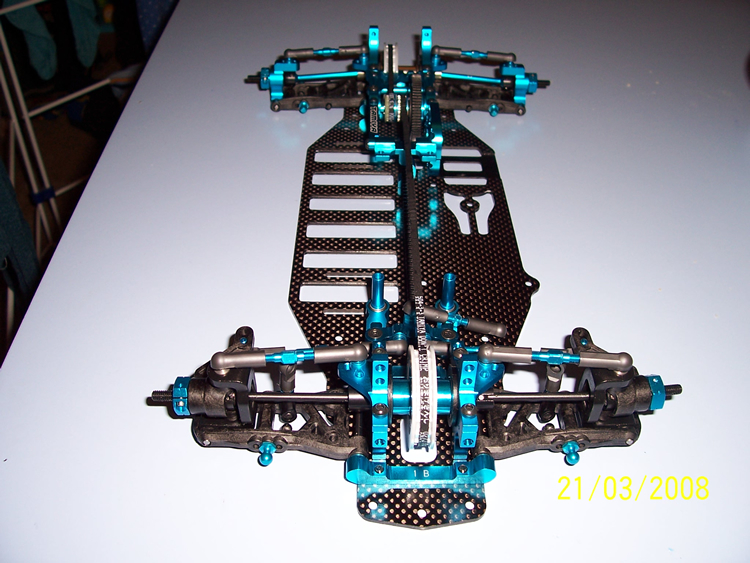 Having already built a set of these for my Tamiya TA05 I knew how silky smooth these are. A little tip is the put a little oil on the clear silicone O rings before you build them and to grip the shock shaft with a piece of thin card or several layers of tissue between the shaft and the pliers. This will ensure the shaft does not get scratched when you are wrenching on the ball end. The latter is mentioned very clearly in the instructions; the oil on the o-ring just makes sure the initial slide of the piston goes through the body of the shock very smoothly. It is very worthwhile taking a lot of time building these up, to ensure all of your suspension is rebounding at an equal level. Put your desired oil in the shock, bleed the piston by moving the shaft up and down very slowly a few times, then screw on the cap. The manual is very good at describing the process involved. 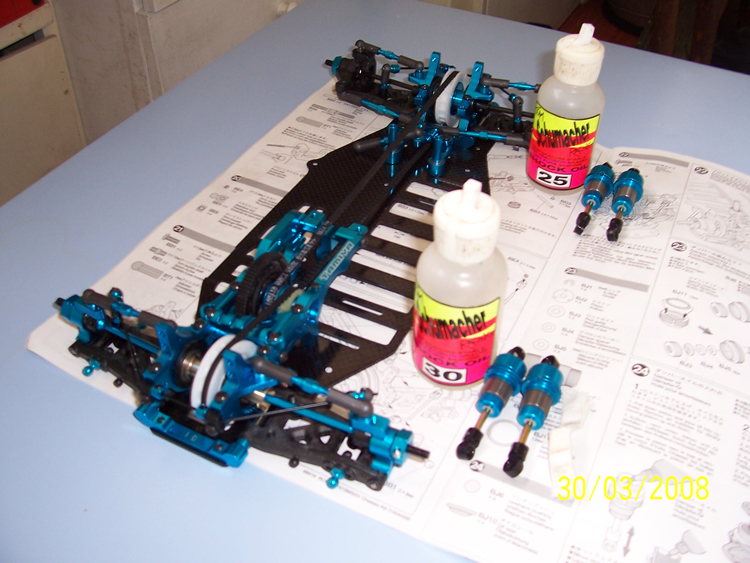 For this review I chose to use Schumacher brand 25 and 30 wt oils for the low level track I race at, come the summer when the grip comes up this will be changed to a higher wt oil. 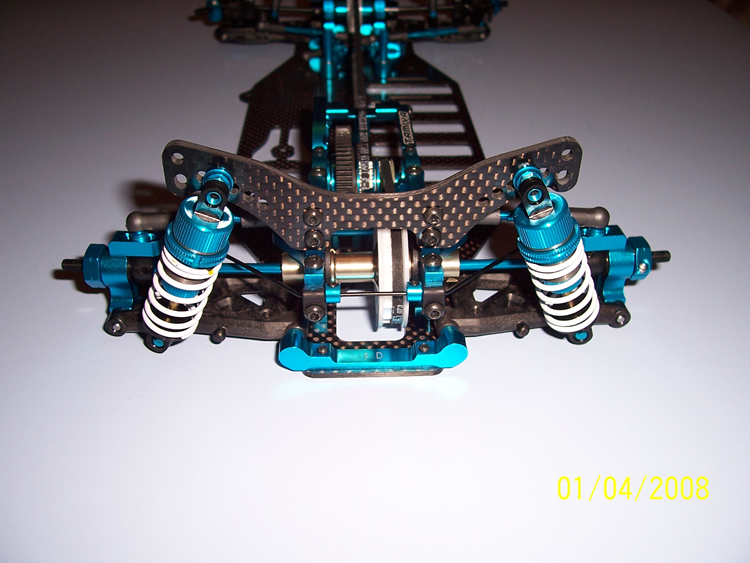 The next picture shows the shock built up with the springs and spring retainer in situ. 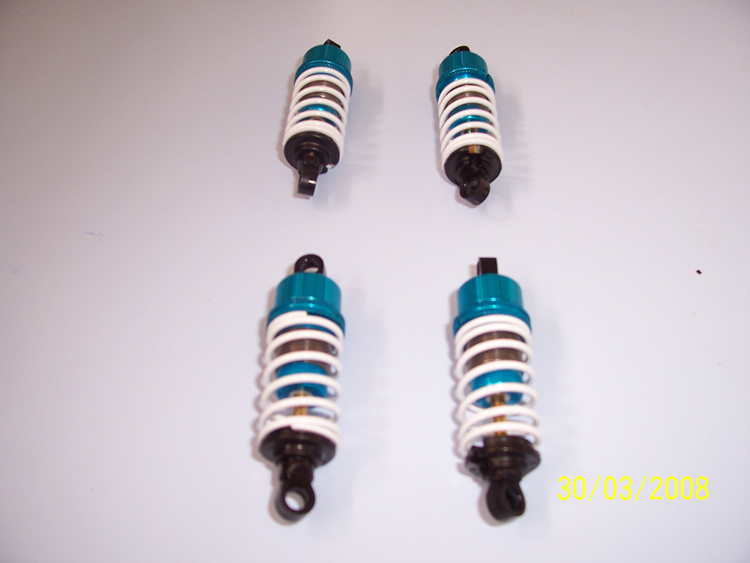 Medium rated springs are supplied with the kit and these are what I will initially try on the first outing on the track. Now the front and rear damper posts have to be screwed onto the car. Make note of the suspension measurement guidelines, adjust the collars on the suspension and install onto the car. 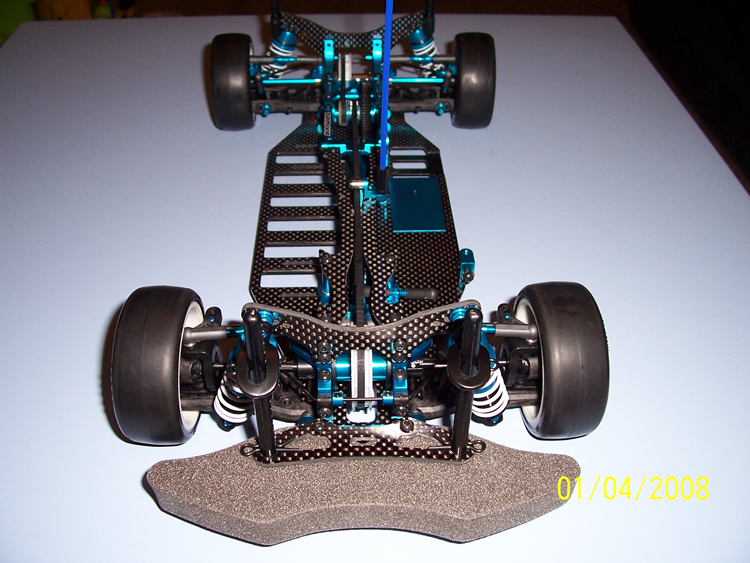 Because I am only focusing on the build of the chassis for now, the next stage was to fit the servo mounts and motor cooling ramp. The latter looks like a well thought out design that should really help the cooling of any motor in the later stages of a qualifying or final race, keeping the motor cooler will keep its rpm and torque at optimum levels for longer. 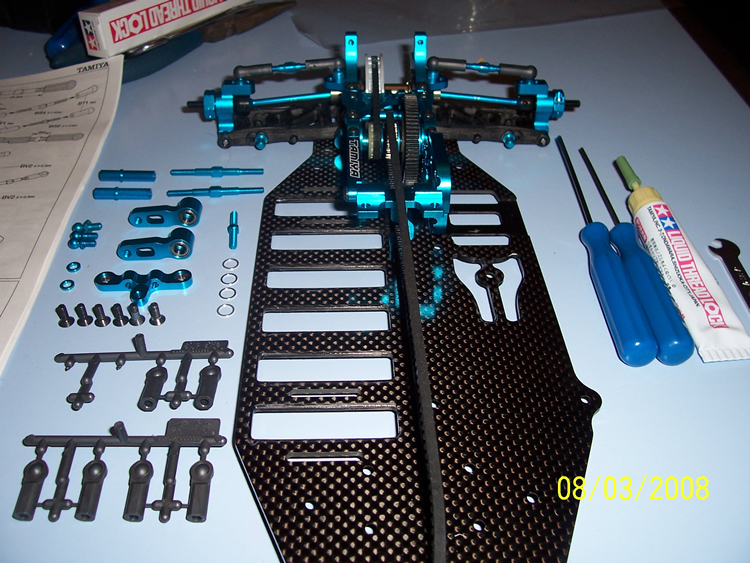 Next on the agenda is installing the upper deck of the chassis and the combined belt tensioner/antenna tube holder. I'd suggest using a little blob of thread lock on each of the screws which go into an alloy part, to prevent it from vibrating loose. 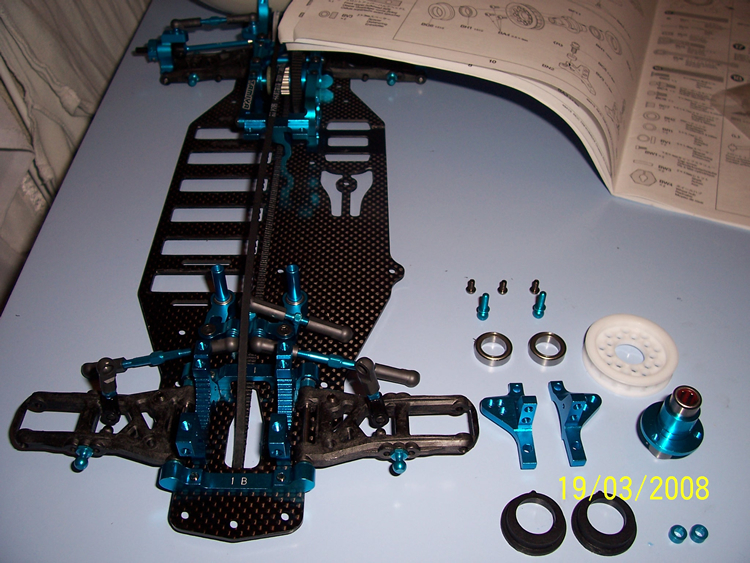 The final step of the build involves attaching the body posts, front bumper and your chosen wheel/tyre package. 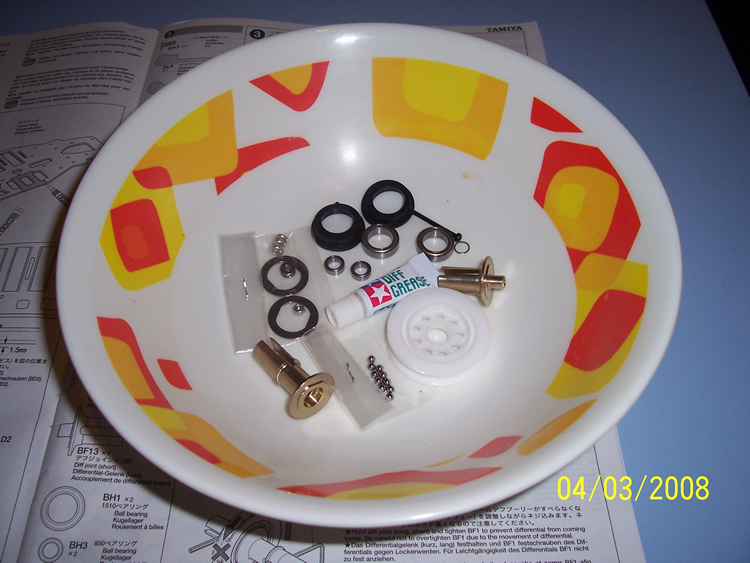 Although the Tamiya wheels supplied are of good quality, I didn't have any inserts or tyres to put on them. So I opted to fit the Sorex 32 premounted tyre on a dish wheel, these are becoming a very popular tyre for 19t and modified class racing and are available at any good hobby shop. So, here we are with the finished product, looking great in every way! The car was a dream to build, the only things left to do are cutting the body posts down to size, installing the body shell of my choice and the electrical installation. I will be covering this in a seperate guide. I hope you have enjoyed reading this as much as I did building it! Many thanks goes to Fusion Hobbies for supplying me the TRF415MSXX kit, Ed Clark (creator of www.thard.co.uk) for the use of text and links to additional information within his website to create this build guide, also to Steve Curtis-Rich for the suspension build tip. 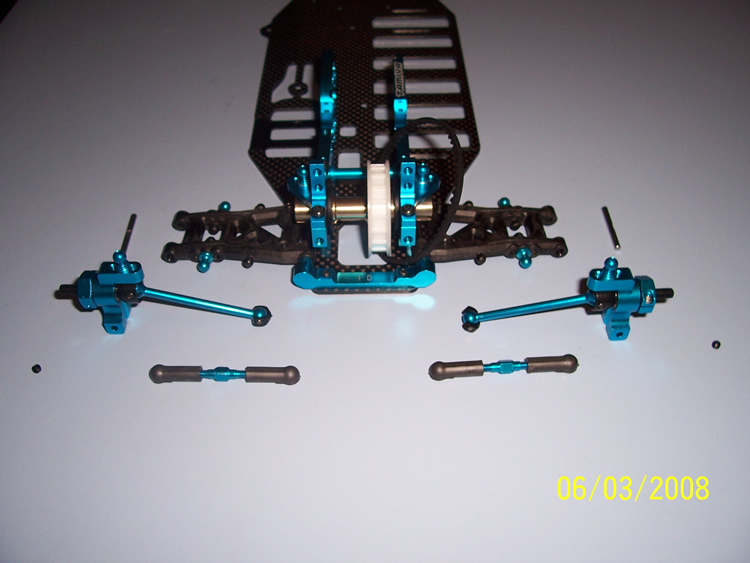 Should you wish to purchase this kit, or a similar one, please contact us for product prices and further information.